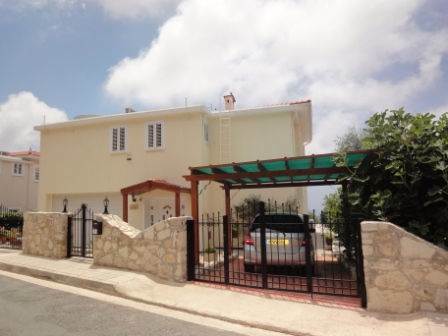 Peyia, Paphos - This impressive detached villa is located in a quite residential cul-de-sac in the popular village of Peyia. The village has a variety of shops and restaurants, and is within easy walking distance. The property has been designed to take advantage of the superb unobstructed panoramic sea views, with the living accommodation and master bedroom on the upper level, and the remaining bedrooms below. Being the current owner’s main residence, the property includes a lot of extras. Stairs lead up from the entrance hallway to a spacious open plan living room, nicely divided into a lounge area with feature fireplace, formal dining area, 2nd seating area and corner kitchen. What is particularly special about this room is the wall of french windows which fold back, giving the sense that the panoramic sea views are part of the room. Another wonderful feature is the beautiful circular domed ceiling skylight in the kitchen which provides additional light and style. Also on the upper level is a large master bedroom & en-suite shower room, a study, and a guest WC. Downstairs, there are 2 double bedrooms, both with patio doors leading to the pool terrace and excellent views. There is also a good size shower room, laundry room, a storage room with fitted shelving, and a smaller storage cupboard under the stairs. A further workshop with lots of fitted cupboards and an adjoining wine cellar, could easily be converted into a 2nd kitchen. The garage has an automatic door and more fitted cupboards. At the rear is a 4th bedroom with patio doors on to the pool terrace, which is being used as a reading room. The pool area has a covered kitchen and bbq area and unobstructed views. Electrically operated sun awnings offer shade when required. The pool has an automatically operated child proof cover, and there are roman steps for easy access. The gardens are well designed with fruit trees, vegetable garden, and a vine covered seating area tucked away in a cosy corner.